As a former Fitzwilliam student you are a lifelong member of the College and are part of a community of over 11,000 alumni all over the world. The Development Office is on hand to help connect you with the College and your fellow Fitzbillies. Welcome back! Fitzwilliam’s friendliness is renowned and you are always welcome to visit, in addition to having access to alumni events and a range of special privileges. In return, you show your generosity through the more than £20 million donated to help the College and our students since 2008. Thank you for your support. Join in our anniversary celebrations! 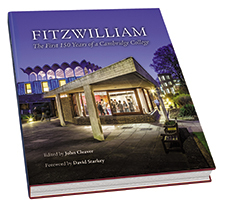 Our book, 'Fitzwilliam: The First 150 Years of a Cambridge College' is on sale.